PRODUCT DESCRIPTION: This comfortable pre-fabricated orthosis is designed for the management of mid-shaft to distal third humeral diaphyseal fractures. The lightweight anatomical design achieves total contact circumferential soft tissue compression for optimal control of humeral segments while allowing range-of- motion of both shoulder and elbow joints. 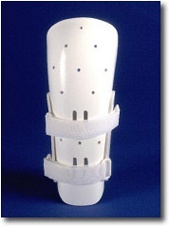 In addition this brace features a deltoid cap extension which provides greater alignment control and prevents distal slippage. Two double thickness cotton stockinette are provided.